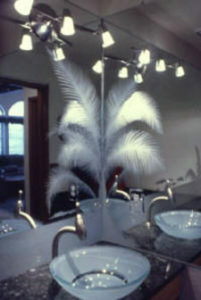 Custom Frameless Mirrors offer many options: etched, beveled, grooved or edged. Available in 1/4″ thickness. Mountain edge mirror reflects the awesome majesty of the Colorado Rockies! This is just one example of the many options that are available with mirror.